It may not seem like it, but spring has officially sprung. And whether the warmer temps have already come your way, or you’re still dreaming of balmy weather, ’tis the season to start picking up fresh florals, refreshing cocktails, and of course, spending time outdoors. 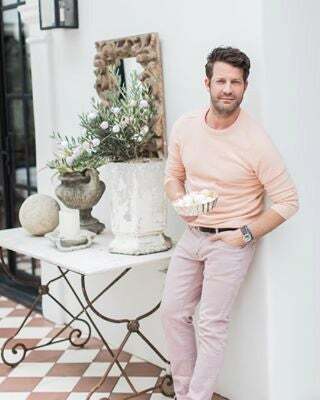 This weekend, we teamed up with designer Nate Berkus (ahead of the premiere of the second season of his hit TLC show, Nate and Jeremiah by Design, which airs Saturday, April 7!) to learn some of his favorite ways to celebrate the season at home. Breathe new life into your home with some greens. As Berkus points out, you don’t have to go far—it can be as easy as trip to your own backyard. Pick a handful of wild flowers or seek out simple greenery (like these branches) from your garden or local florist. Not a fresh floral person? Pick up a new, stylish houseplant. No matter the size, adding a new plant to your collection will instantly spruce up your space. Of course, no party is complete without a perfectly stocked bar cart—but just because it’s an entertaining staple doesn’t mean it has to be boring. We love the way Berkus added personal touches to his bar area with trinkets from various travels and meaningful mementos. And as Berkus reminded us, everyone has space for a “bar cart” (yep, even you NYC tiny apartment dwellers). If you don’t have an actual cart to hold your favorite cocktail ingredients, placing them on a large antique platter atop your credenza works fine, too. Whether you have a patio, balcony, or backyard, once the weather heats up, it’s an automatic indication to move your party outside. We love the creative lighting in Berkus’ garden, but not all of us are lucky enough to have a giant tree to hang a pendant from (maybe someday!). Luckily, strand lights can be equally as chic. Ditch your ceramic dinnerware inside and leave your al fresco entertaining to our favorite melamine designs. They’re durable, seasonally bright, and will convince you to leave all plastic dinnerware in the past.